Another major player could soon be headed to Warner Bros.' upcoming Joker movie. The Wrap is reporting that Frances Conroy is in talks to join Joaquin Phoenix the upcoming live-action venture. Conroy is being tapped to play the Joker's mother, a woman by the name of Penny. Conroy is the second actress to be associated with the character, after it was revealed earlier this month that Frances McDormand turned down the same role. Apparently, DC wanted a "name" to play the role of the Joker's mother, and it looks like they could get their wish with Conroy. Conroy has had a pretty prolific acting career, and is known for her roles in Six Feet Under, 6 Souls, and Maid in Manhattan. This would be the actress' latest DC Comics movie role, after appearing as Ophelia Powers in the Halle Berry-led Catwoman movie. A previously-released casting description for the role of Penny can be found below. "Supporting Female (60-74) Caucasian. Lower class, very attractive in her younger days, still feels that way about herself. But recently her health has started failing, and she’s nearly bedridden in her Lower East Side apartment which she shares with her grown son who just moved back home. She’s obsessed with her former employer and can’t believe that this is what her life has come to, that she has ended up here, like this." If Conroy does take the role, she will join what is already a pretty eclectic cast. In addition to Phoenix playing the Clown Prince of Crime, Zazie Beetz is reportedly in talks to play a single mother role, and Robert De Niro is being eyed to play a talk show host. The film, which is expected to begin production this September, will be directed by Todd Phillips and executive produced by Martin Scorcese. In March, a report suggested that the film would follow the Joker as an '80s comedian, who turns to a life of crime after his stand-up career fails. And as it turns out, Phoenix has had that sort of idea kicking around in his head for quite some time. 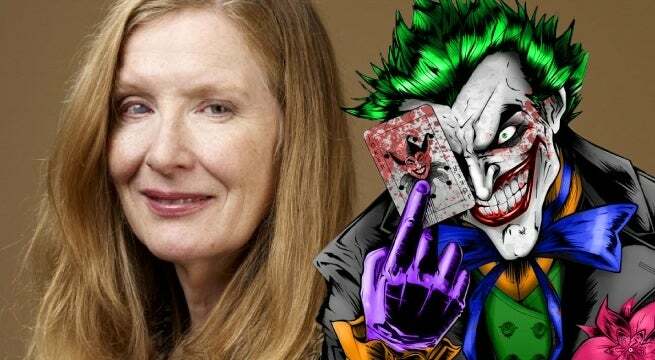 Do you want to see Frances Conroy join Joker? Let us know what you think in the comments below.